Inspired by the Tempo Rogue, Colma crafted the Tempo Warrior Deck which brought him to top 50 Legend during season 3. 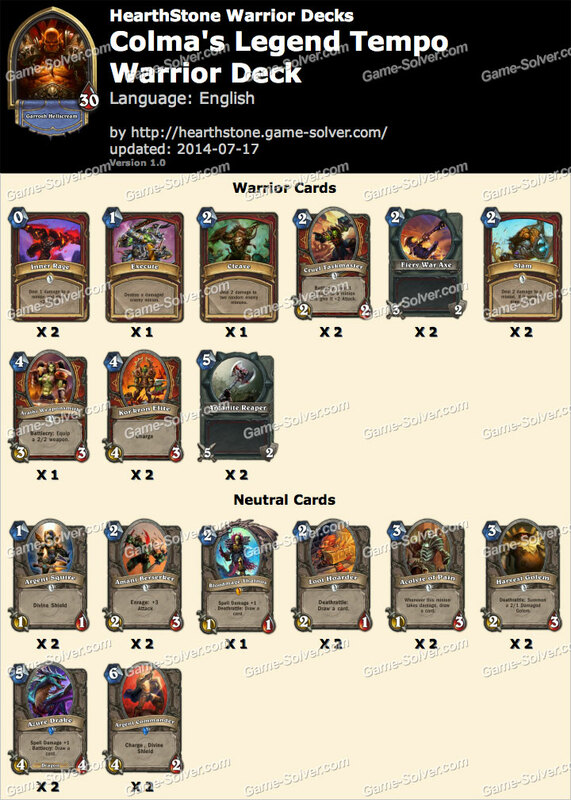 The Tempo Warrior Deck is not a pure aggro deck instead it has more value based minions and a bunch of removals to gain board control. There are lots of card draw to keep it going until the end, and it is not uncommon that you will end up with above six cards in the hand at turn 5 even though you try to use all the mana every turn thanks to Acolyte of Pain + Cruel Taskmaster synergy and some other cards. You will also notice that there are lots of weapons and chargers to be able to gain and keep board control quickly. Neither is this an ordinary control deck, even though the main aim to control the board, it does so by filling up the board with minions instead of just stalling for late game legendaries which is common with control warrior decks. Against control decks, try to mulligan for early drops like Argent Squire, Loot Hoarder, and Amani Berserker. Fiery War Axe would be great as well if you got one of those three cards. Against aggro decks, try to mulligan Cleave, Cruel Taskmasters, and Fiery War Axe. When going second, you can afford to keep one more card like Inner Rage which would be used to kill one of their 1 health minions like Young Priestess or Leper Gnome.